Cyclodomorphus gerrardii has a slender body with a long, slender and slightly prehensile tail about the same length as the body. The limbs are well developed with long digits and sharp claws. The neck is well pronounced and the head is relatively large, wider in males than in females. In adults the tongue is pink. Cyclodomorphus gerrardii has a slate-grey to fawn dorsal ground colour with dark grey to brown or black cross bands. These bands are more pronounced in males and less so in females. 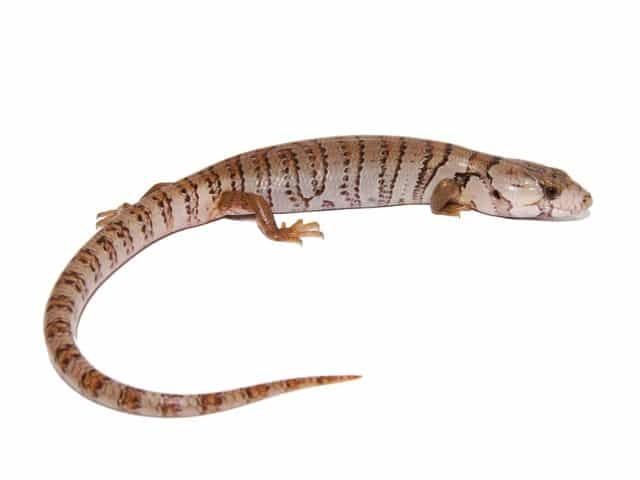 Although a single adult pink tongue skink can be successfully maintained in an enclosure the size of a standard ten-gallon glass aquarium, I would recommend somewhat larger living quarters. I have found that clear plastic storage containers (0.5 long X 0.35 wide X 0.4 high meters (1.6 x 1.15 x 1.3 feet)) work well for 1-2 adult pink tongue skinks (0.45 meters (1.5 feet) size adults). Hiding places are especially important when housing more than one adult, as they may occasionally act aggressively towards each other—larger enclosures will allow the addition of multiple hiding places. Vertical cage space is also important as these lizards like to occasionally climb and bask on vertically placed branches and cork bark. Enclosures are outfitted with hardware cloth or wire lids that allow for both good air flow and light penetration, while preventing escape. I place small pieces of cork bark on the cage substrate which is utilized as a hiding place for the skinks. Pink tongue skinks also like to hide below the surface in the substrate. Hiding places are especially important when maintain multiple adults together. Pink tongue skinks like to burrow and a number of substrates are suitable for the floor of their enclosures. I use several inches of non-toxic shredded wood mulch, but other acceptable choices include soil, peat/sphagnum moss, or bark chips. Because wild pink tongue skinks are found in wet sclerophyll forests, rain forests and moist woodlands in their native Australia, the substrates in an enclosure should be kept slightly moistened which is especially important for proper ecdysis to occur. I suggest using ultraviolet lighting when keeping pink tongue skinks. While there is no empirical evidence to my knowledge that pink tongue skinks need ultraviolet lighting for proper health and calcium metabolism, I tend to side with caution and provide fluorescent fixtures suspended within a few inches of the top of the enclosure. Incandescent spot lights are also provided for heat and are carefully placed directly above an appropriate basking spot. It is always wise to use a fast reading digital thermometer or temperature gun to carefully check the basking temperature which should be maintained around 34-36 °C (94-97 °F). Ambient temperatures during the day in my collection vary, but are generally maintained around 25-29 °C (78-85 °F). Clean water is a requisite when maintaining pink tongues. I use shallow (1” deep) bowls that allow the lizards to drink as needed. I tend to slightly overfill the bowl, letting the water flow into the substrate- a great aid when the skinks are shedding. I keep my pink tongued skinks at the humidity level of 50-70%. Pink tongue skinks eat a variety of snails, slugs, and other invertebrates in the wild. They possess large, flattened teeth in the rear of their mouths which are believed to be used to crush snail shells. In captivity, these lizards readily eat snails, slugs, earthworms, wax worms, meal worms, pink mice, bananas and other fruit, cat food, dog food, chicken, and beef. I use a prepared diet known as Mazuri omnivore diet, a pelletized food specifically formulated for omnivores in zoological institutions. It is available in a dried biscuit-like form which is easily softened in water. I tend to add a small amount of canned dog food to the softened omnivore diet at a ratio of 3:1 as well as a light dusting of calcium with D3. While the omnivore mixture is an easily prepared food, it is essential to feed these lizards as wide of a variety of acceptable foods as possible to ensure health. 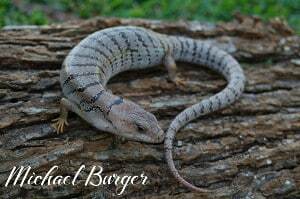 Unlike some blue tongue skinks and prehensile tailed skinks (Corucia zebrata), which bite quite readily as well as hard, adult pink tongue skinks are not only slow moving, but one of the most docile and easy-to-handle skinks. Juveniles tend to be rather skittish in nature and usually defecate when handled, so handling should be maintained to a minimum until they become accustomed to your presence. Adults quickly lose their timid behavior and are easily picked up. Cage substrates should be periodically changed as needed, at which time one should thoroughly scrub the enclosure and disinfect with an appropriate diluted disinfectant. Be sure to thoroughly rinse the enclosure after cleaning and disinfecting. Water bowls, bark, and branches should also be cleaned as needed. Pink tongue skinks periodically shed their outer layer. It is essential to provide a slightly moistened substrate in order to ensure proper ecdysis. Pink tongue skinks present few problems when properly maintained.